DAYTON (Ohio), July 26, 2018 — For the final DP&L Summer in the City signature event, the Downtown Dayton Partnership and its local arts partners will pull out all the stops. Art in the City takes place Friday, August 3, in conjunction with First Friday activities. To date, there are about 400 local artists participating in the free arts and cultural festival. “The arts play an important role, not only in attracting businesses to our region, but they make a huge economic impact, as well,” said DDP President Sandra Gudorf. According to the 2017 Americans for the Arts’ Arts & Economic Prosperity report, the nonprofit arts and culture industry has a $213.7 million impact in the Dayton Region, supports 8,829 full-time equivalent jobs, and generates $23.9 million in local and state government revenues. The juried art show, curated by the Dayton Visual Arts Center, returns with a new twist on the exhibit that places local artists in downtown businesses. About 15 artists will have several pieces on display at participating businesses. The installations will be up for two weeks, and the public is invited to vote for their favorite body of work. The winning artist takes home $250! The juried show debuts on August 3 and voting is open until Friday, August 17. To celebrate the kickoff for the juried art show, downtown will be buzzing with arts activities, featuring both visual and performing arts. K12 Gallery & TEJAS will bring back the popular “yarn bomb,” connecting their space at Patterson and Jefferson streets to the Oregon District. At K12, programming has grown to include a new Creative Kids Market, offering children the opportunity to develop entrepreneurial skills by selling handmade merchandise. There will also be an exhibit by artist Marilyn Hart, and live music by the Kellen Williams Trio, Next to Nowhere, and former American Idol contestant Alexis Gomez. Food and beer will be available for purchase. Downtown’s Avenue of the Arts (Main Street between First and Second) will be activated that evening, featuring performances inside and outside the Schuster Center, Victoria Theatre, and the Loft Theatre. Most programs are scheduled from 5 to 8 p.m. The DP&L Stage inside the Wintergarden will feature live performances, and the new Community Stage will be right outside the Schuster Center, next to the Citilites Bier Garten. 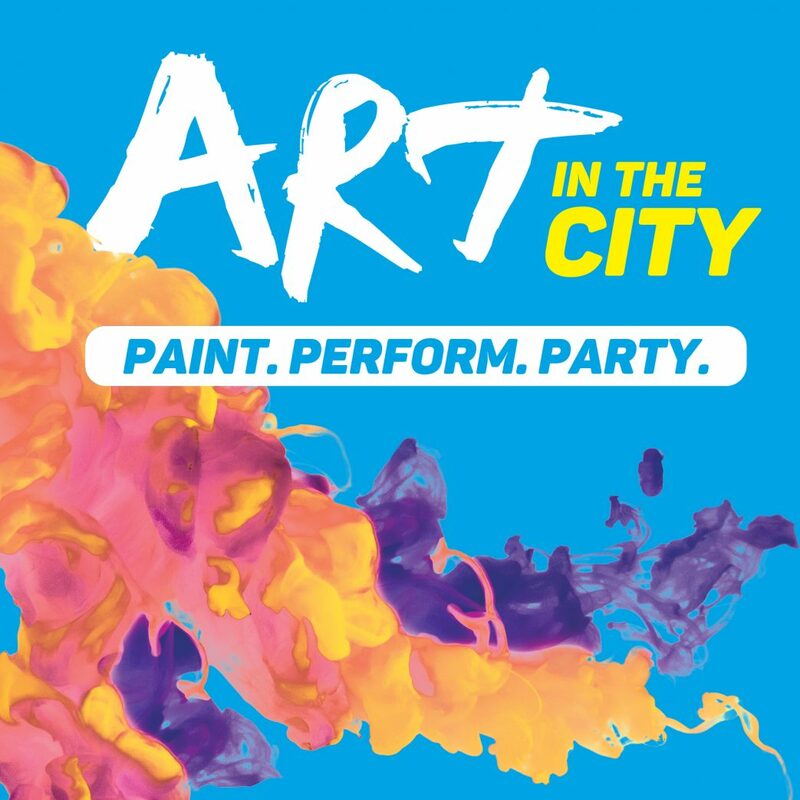 The public is invited to sign up for a stage time spot on the Art in the City website. The new Artisan Market will be along Second Street, offering handmade products from local vendors. Another addition to this year’s lineup enhances the popular Party on the Patio feature. “When we surveyed our guests from last year, one thing they really wanted was a culminating event,” Gudorf said. “They wanted someplace to gather once they were finished exploring all the art activities.” The Fifth and Jefferson Party includes the Dance Stage with live performances by the Dayton Ballet and various Dayton-based cultural organizations, and the Funk Lab Dance Center’s festival, with a live DJ, street art, and of course, street-style dance battles. These activities will fill the hours from 5 to 8 p.m., and the encore Art in the City performance will be music by Sonic Mojo from 8 to 10 p.m. Other art-making activities will be programmed at the Fifth and Jefferson Party, and food, beer, and wine will be available for purchase. Complimentary transportation also will be offered, again as a response to public feedback from last year’s event. Greater Dayton RTA is providing buses that will serve as shuttles, and the Dayton Pedal Wagon will offer hop-on, hop-off rides on the multi-passenger cycle. Live entertainment will be on board both Pedal Wagons. Shuttles will run from 5 to 9 p.m. on fixed routes. (See map for details.) Free parking can be found at the Arts Garage (Second and Ludlow), K12 Gallery & TEJAS (341 S. Jefferson St.), and on-street metered spaces are free after 6 p.m. The Main Street garage (Main and First streets) will be open with parking available at a $3 rate, and the Oregon District garage (Fifth Street between Patterson and Jefferson; conveniently located next to the Fifth and Jefferson Party patio) only charges $1 for parking after 6 p.m. Use the DDP’s parking guide to locate more garages and lots. Other hot spots that evening include Courthouse Square where United Way of Greater Dayton will host its kickoff event, and RiverScape MetroPark, featuring its First Friday lineup of Pickin’ in the Park bluegrass music. The Oregon District will host dozens of Party on the Patio entertainers, and the Dayton Metro Library will have activities taking place inside and outside the space. Download a copy of the map from the website, or pick one up the night of the event from any of the three information stations, or participating businesses, and make a plan to “Paint. Perform. Party.” at Art in the City! DP&L Summer in the City and Art in the City is a program of the Downtown Dayton Partnership and is sponsored by Dayton Power & Light, Cox Media Group Ohio, the Jack W. and Sally D. Eichelberger Foundation of the Dayton Foundation, and the Ohio Arts Council, with additional support from 91.3 WYSO. Art in the City program partners include Culture Works, the Dayton Art Institute, the Dayton Performing Arts Alliance, the Dayton Visual Arts Center, K12 Gallery & TEJAS, the Human Race Theatre Company, and the Victoria Theatre Association. More information about DP&L Summer in the City will be available online at downtowndayton.org. Pick up DP&L Summer in the City calendars at downtown businesses or at DDP info tables during signature events. The best way to ensure not to miss a single minute of downtown action is to subscribe to the DDP’s e-vents email newsletter. This weekly roundup includes the most up-to-date list of events with addresses, prices, contact information and more. Visit downtowndayton.org/subscribe to sign up.